Not to be confused with Scratch from Helsingborg. In 1981 Niklas Olausson (age 13) started to hang out with 2 years older Mats Johansson. Niklas played guitar and Mats was a drummer. After a while they realized that something was missing. They needed more guys to start a band. In 1982 guitarist Anders Folbert and bass player Johan Melin joined and they started a band named FBI. The band started to do concerts at local places. In 1983 they changed the name to Scratch. Local newspapers started to write about "the kids" from the tiny village of Nättraby. Like most kids of their age there were no limits whatsoever. To prepare themselves to an international career as rock stars ;-) they decided to change their names to something that was easier to pronounce, so Niklas became "Nic O'Noon" (later changed to "Nico Noon"), Mats became "M.J. Masen", Anders became "Andy T" and Jörgen changed to "John Mell". What could ever stop them now? In 1984 guitar player Peter Wilhelmson, known as "Pete Meat" joined the band and Nico could concentrate on vocals. They now had quite an impressive number os songs and they started to dream of making a record. Like all "successful" bands they needed a mananger and this positiona was given to their friend Rickard Karlsson ("Rick Twilight, of course he needed an international name too). He started to organize more professional gigs with plenty of pyrotechnics involved. This part was handled by another friend named Johan Svensson (nicknamed John Bomb). Another friend to the band made the logo in typical 80's style. His name is Peter Stridmark and was also involved in the concerts. Of course he also needed a fun nickname so he became "Pete Battleground"!. In late 1984 Ric decided to finance a record containing 2 songs. They chose "Before the Rain" and "Metalbreaker". The recording took place in a local studio in the town Karlskrona named "Voice". It was produced by Mats "Flax" Johansson (later Nilander). At this time it was quite unusual for unknown bands to make records so the local media wrote a lot about it. The single was released '85 in 1500 units and was mostly sold locally. In May of that year, the band performed with other bands on a bigger stage where the headline was the iconic band Europe. At this concert they almost destroyed Europe's keyboards with pyrotechnics, but that's a different story. The same years John left the band and was replaced by Torbjörn "Toba" Andersson. In 1985 the worlds focus was on the starving people in Ethiopia and the song "We are the World" was recorded by Michael Jackson and a bunch of stars as a charity project. The thought of doing something in a local scale was born and that year Ric organized a cherity concert with 6 bands which was a great success. Over 3000 spectators came to support the project. The concert was called "To Africa With Love". A single with the same named was written by Nico Noon and the six lead singers of the bands can be heard on the record that also was released in 1985. This was also printed in a small scale, produced by Mats "Flax" Johansson (later Nilander) and sold locally so it's not easy to find a copy nowadays. In 1986 the band recorded 3 songs: "People", "Angel of the Night" and "Crazy Love". Once again the producer was Mats!. This time keyboard was more present and handled by Pete. In autums of 1986, Ric one again arranged "To Africa With Love". As another band had released an album under the name Scratch, the band performed under the name Kazandra during it's last year. Per-Ola Andersson (no nickname) joined the band on keyboard. In 1987 the band represented the region of Blekinge in the "Rock Sun" (National competition of Rock) in the class of younger band members. This competition started in 1982 and the first winners were Europe. In 1987 some of the members decided to get quality-educations so there wasn't enough time to go on with the band (they were kids, remember?). The last official performance was on a classic rock stage in the town of Lund, named "Olympen" that same year. All of the former band members (and the other guys) live in the same area and they see each other now and then. During the intensive years they wrote a bunch of songs that were played at the concerts. There are no other recordings from these years than the ones on this album. Some plans have made to do recordings of the other songs too and who knows? You may not have heard the last of the band!. Released a 7" in 1985 entitled 'Before the Rain / Metal Breaker'. 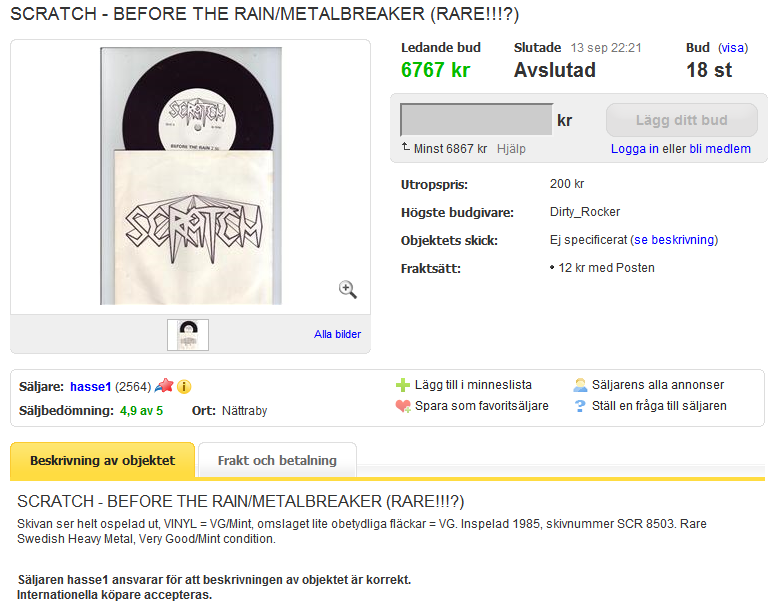 The single was sold for about 700€ at the Swedish auction site Tradera in 2010 and the swedish newspaper wrote an article about it where Janne Stark and SCRATCH's manager Rickard Karlsson said some words about the band. The song "Before the Rain" was also played in Swedish Radio shortly afterwards. Niklas Olausson, Peter Vilhelmsson and Mats Johansson have also contributed on the V/A 7" single 'To Africa With Love (1986)' together with members from INTERACTION, SHANAHAN, DECEPTION and E-TYPE. It was sold to raise money for the Ethiopia charity. 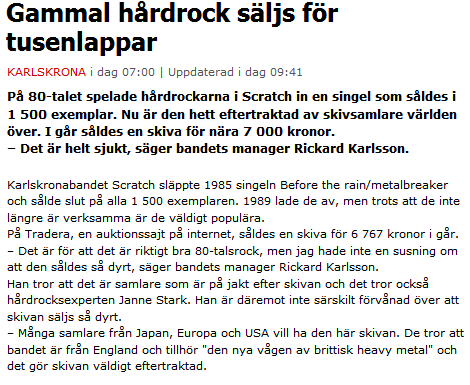 In 1985 the Karlskrona band SCRATCH released the single "Before the Rain" in a limitation of 1500 copies and it was not really some huge successes, even though the band actually got to be the opening act for EUROPE once. But collectors have become extremly interested in the single lately and yesterday (13/9-2010) a copy was sold for 7000kr (ca 1000$) on an internet auction. -From the beginning, it was probably a mistake, ten years ago Japanese collectors thought that we were a new band from England and then it became a thing out of it and the price was inflated, said the band's singer Niklas "Nico Noon" Olausson to Morgonen. But a comeback does not seem up to date, despite the obvious urge for SCRATCH.